When it comes to pregnancy and parental leave, it can be difficult to navigate the maze of paid and unpaid leave and accommodation laws that can apply, not to mention organizational policies! In fact, managing all of the various types of leave laws that apply to employees is slated to be one of the top challenges facing human resources in 2019! 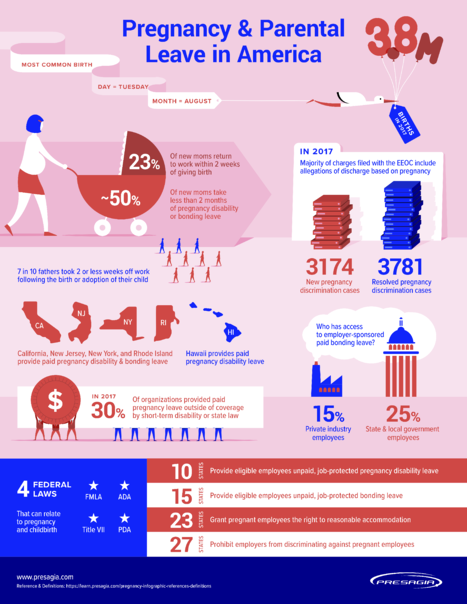 That's why we created a brand new infographic to bring you up to date statistics and information about pregnancy and parental leave in the United States! Simply click the image below (or here) to view and download a PDF of our infographic! Are you interested in learning more about how you can use software to comply with all of the pregnancy and parental leave laws affecting your organization? We're here to help with our cloud-based Presagia Leave solution! Can't get enough infographics? Make sure to check out our FMLA Infographic too!